The title of J-K. Huysmans’ most famous novel, À rebours, can be translated as Against Nature or Against the Grain. But, for me, it is the second possibility that is the more appealing. 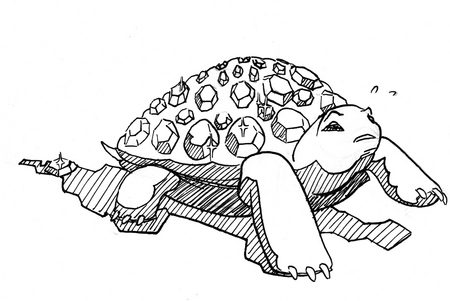 In the novel, the high-dandiacal protagonist, Des Esseintes, escapes into a Hinterland of his own creation, living a stylised, aesthetic life far from the nearest townfolk; he reads heretical literature, he mixes experimental cocktails, and he emblazons the shell of his pet tortoise with a wealth of precious stones. His tastes are decadent, gaudy even, and in their concentrated contrarianism, they are against nature. But Des Esseintes’ desire to escape is entirely natural; that he contrives to do it, and succeeds in doing so, is against the grain. The idea of Against the Grain is wider-reaching, spanning from the self-indulgent aesthete to the self-effacing ascetic and all the points between. Any Escapologist (and you, reader, may be one) would fall somewhere along the spectrum, as Escapology itself requires one to break from convention or go against the accepted way of doing things. How else would one escape? Huysmans himself never made the sort of escape that Des Esseintes did (although, interestingly, they would die in similar circumstances). He whored and debauched in his youth, but was subsidised through it all by his well-paid job in the civil service; he was a weekender, working five days, writing at night, then carousing with artists in his free time. It was only after the success of his novel, Là-Bas, an exploration of Satanism in 19th century Paris, that he contemplated change. His research into spiritualism brought about his conversion to Catholicism, which would (as it so often does) affect his life irrevocably. It was an unconventional choice at the time, as anticlericalism had been fierce in France since the Revolution and was especially strong in Huysmans’ later religious decades of the 1880s and 90s. He would document his slow conversion over the span of three novels (En route, La cathédrale, and L’Oblate), detailing his retreats and short stays in country monasteries with Trappist and Benedictine monks. The simple life of the cloisters appealed to him; it was far removed from the Bourgeois concerns of then-modern Paris, from meaningless jobs, fanciful decadence, and empty, sensationalist literature. He considered himself, however, unfit for the monastic life, but hoped to become an oblate – a lay Catholic who lives near the grounds of a monastery or convent, helping the brothers and sisters in their hermitage. In fact, he planned to found a commune of artist-oblates, who would aid the monks for part of the day and create redemptive art for the remainder. When his idea of becoming an oblate was made public – revealed in the paper by an unscrupulous literary journalist – his employers at the Ministry of the Interior were both embarrassed and supremely helpful, suggesting that he retire from their department at once. Still, even with this forceful encouragement, Huysmans had his doubts. He recorded them, in his writerly fashion, in a list; his novels are full of them, though this is the only one reproduced in Robert Baldick’s biography. Many of us will avoid romantic confrontations with the Spanish woman (the Countess de Galoez in this case), but, for most would-be Escapologists, the other pros and cons read here will be familiar: others are against or do not understand your escape; life will be somehow tougher; fear; that you may do more good within the system; and for “no holiness” read lack of discipline, self-sufficiency, or ability. And I have only listed those Against. For anyone contemplating an escape, the “Against” column will often look bigger and the things in it more concrete and real. They are genuine uncertainties about the thoughts of friends and family and our capacity to take care of ourselves. In comparison, the “For” column is meagre, populated only with “obscure feeling(s)” and “vague attraction(s).” All that spurs on Huysmans is dissatisfaction with his life as a journalist (and any opportunity to trounce the Spanish woman in debate). But the “For” column represents the future and, as the future is unknown, it can only be guessed at, intuited, and obscurely felt. That it totes up only unhappiness with one’s current life and the belief that a better one exists should still trump all in the other column. The minutiae of “Against” is, on reflection, nothing more than Bad Faith. Tackled in Issue Four of New Escapologist, Bad Faith is the notion that one will roll over at the command of the world, playing one’s role in society, and taking no responsibility for one’s own actions. It can be a hard thing to beat and Huysmans’ list shows why: society is all around, it is set in its ways, and its arguments seem to outweigh the few wisps of hope that are “For”. To overcome Bad Faith, one must take chances, look to the future (where the unknown is kept), and go Against the Grain. Huysmans is probably not the best example to follow though. He did not stay an oblate for long, abandoning the commune idea and, upon returning to Paris, he wrote a fictionalised account of the experience, which received heavy criticism from his own Catholic church. He probably spent too much time worrying about lists to concentrate on his religious duties. At the end of À rebours, Des Esseintes decides he must return to Paris too. He saw no other option. Even the feckless dandy figure had his doubts; still, he died straight away. It can be a difficult thing to do, breaking Bad Faith; Huysmans and Des Esseintes would agree, certainly. And, though each of them was disheartened, there is no reason that you should be. For Bad Faith is overcome, not by success, but by action that may lead to success. If one’s effort fails – you do not found your oblate commune; you tire of your ornamental hideaway – there is still the fact that, in so acting, one overcame Bad Faith. This is an achievement in itself and, once done, it can done again and again, each time more easily and more naturally. For there is no point in going only partially Against the Grain.